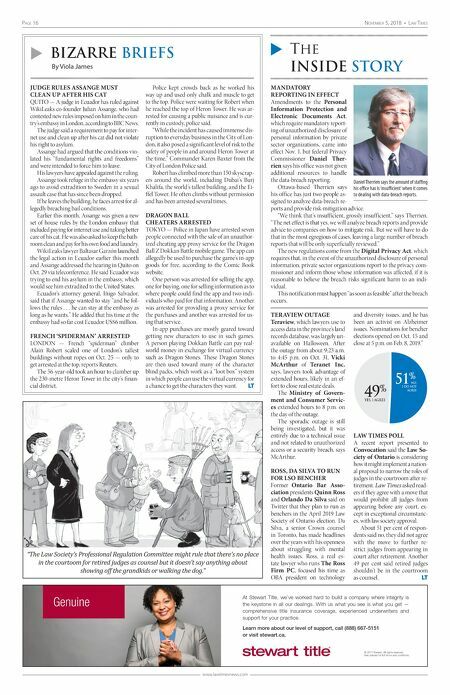 Page 16 November 5, 2018 • Law Times www.lawtimesnews.com u Bizarre Briefs By Viola James u The InsIde story "The Law Society's Professional Regulation Committee might rule that there's no place in the courtoom for retired judges as counsel but it doesn't say anything about showing off the grandkids or walking the dog." JUDGE RULES ASSANGE MUST CLEAN UP AFTER HIS CAT QUITO — A judge in Ecuador has ruled against WikiLeaks co-founder Julian Assange, who had contested new rules imposed on him in the coun- try's embassy in London, according to BBC News. The judge said a requirement to pay for inter- net use and clean up after his cat did not violate his right to asylum. Assange had argued that the conditions vio- lated his "fundamental rights and freedoms" and were intended to force him to leave. His lawyers have appealed against the ruling. Assange took refuge in the embassy six years ago to avoid extradition to Sweden in a sexual assault case that has since been dropped. If he leaves the building, he faces arrest for al- legedly breaching bail conditions. Earlier this month, Assange was given a new set of house rules by the London embassy that included paying for internet use and taking better care of his cat. He was also asked to keep the bath- room clean and pay for his own food and laundry. WikiLeaks lawyer Baltasar Garzón launched the legal action in Ecuador earlier this month and Assange addressed the hearing in Quito on Oct. 29 via teleconference. He said Ecuador was trying to end his asylum in the embassy, which would see him extradited to the United States. Ecuador's attorney general, Iñigo Salvador, said that if Assange wanted to stay "and he fol- lows the rules . . . he can stay at the embassy as long as he wants." He added that his time at the embassy had so far cost Ecuador US$6 million. FRENCH 'SPIDERMAN' ARRESTED LONDON — French "spiderman" climber Alain Robert scaled one of London's tallest buildings without ropes on Oct. 25 — only to get arrested at the top, reports Reuters. The 56-year-old took an hour to clamber up the 230-metre Heron Tower in the city's finan- cial district. Police kept crowds back as he worked his way up and used only chalk and muscle to get to the top. Police were waiting for Robert when he reached the top of Heron Tower. He was ar- rested for causing a public nuisance and is cur- rently in custody, police said. "While the incident has caused immense dis- ruption to everyday business in the City of Lon- don, it also posed a significant level of risk to the safety of people in and around Heron Tower at the time," Commander Karen Baxter from the City of London Police said. Robert has climbed more than 150 skyscrap- ers around the world, including Dubai's Burj Khalifa, the world's tallest building, and the Ei- ffel Tower. He often climbs without permission and has been arrested several times. DRAGON BALL CHEATERS ARRESTED TOKYO — Police in Japan have arrested seven people connected with the sale of an unauthor- ized cheating app proxy service for the Dragon Ball Z Dokkan Battle mobile game. The app can allegedly be used to purchase the game's in-app goods for free, according to the Comic Book website. One person was arrested for selling the app, one for buying, one for selling information as to where people could find the app and two indi- viduals who paid for that information. Another was arrested for providing a proxy service for the purchases and another was arrested for us- ing that service. In-app purchases are mostly geared toward getting new characters to use in such games. A person playing Dokkan Battle can pay real- world money in exchange for virtual currency such as Dragon Stones. These Dragon Stones are then used toward many of the character blind packs, which work as a "loot box" system in which people can use the virtual currency for a chance to get the characters they want. LT MANDATORY REPORTING IN EFFECT Amendments to the Personal Information Protection and Electronic Documents Act, which require mandatory report- ing of unauthorized disclosure of personal information by private sector organizations, came into effect Nov. 1, but federal Privacy Commissioner Daniel Ther- rien says his office was not given additional resources to handle the data-breach reporting. Ottawa-based Therrien says his office has just two people as- signed to analyze data-breach re- ports and provide risk-mitigation advice. "We think that's insufficient, grossly insufficient," says Therrien. "The net effect is that yes, we will analyze breach reports and provide advice to companies on how to mitigate risk. But we will have to do that in the most egregious of cases, leaving a large number of breach reports that will be only superficially reviewed." The new regulations come from the Digital Privacy Act, which requires that, in the event of the unauthorized disclosure of personal information, private sector organizations report to the privacy com- missioner and inform those whose information was affected, if it is reasonable to believe the breach risks significant harm to an indi- vidual. This notification must happen "as soon as feasible" after the breach occurs. TERAVIEW OUTAGE Teraview, which lawyers use to access data in the province's land records database, was largely un- available on Halloween. After the outage from about 9:23 a.m. to 4:45 p.m. on Oct. 31, Vicki McArthur of Teranet Inc. says, lawyers took advantage of extended hours, likely in an ef- fort to close real estate deals. The Ministry of Govern- ment and Consumer Servic- es extended hours to 8 p.m. on the day of the outage. The sporadic outage is still being investigated, but it was entirely due to a technical issue and not related to unauthorized access or a security breach, says McArthur. ROSS, DA SILVA TO RUN FOR LSO BENCHER Former Ontario Bar Asso- ciation presidents Quinn Ross and Orlando Da Silva said on Twitter that they plan to run as benchers in the April 2019 Law Society of Ontario election. Da Silva, a senior Crown counsel in Toronto, has made headlines over the years with his openness about struggling with mental health issues. Ross, a real es- tate lawyer who runs The Ross Firm PC, focused his time as OBA president on technology and diversity issues, and he has been an activist on Alzheimer issues. Nominations for bencher elections opened on Oct. 15 and close at 5 p.m. on Feb. 8, 2019." 51 % NO, I DO NOT AGREE YES, I AGREE 49 % LAW TIMES POLL A recent report presented to Convocation said the Law So- ciety of Ontario is considering how it might implement a nation- al proposal to narrow the roles of judges in the courtroom after re- tirement. Law Times asked read- ers if they agree with a move that would prohibit all judges from appearing before any court, ex- cept in exceptional circumstanc- es, with law society approval. About 51 per cent of respon- dents said no, they did not agree with the move to further re- strict judges from appearing in court after retirement. Another 49 per cent said retired judges shouldn't be in the courtroom as counsel. LT Genuine © 2017 Stewart. All rights reserved. See policies for full terms and conditions. At Stewart Title, we've worked hard to build a company where integrity is the keystone in all our dealings. With us what you see is what you get — comprehensive title insurance coverage, experienced underwriters and support for your practice. Learn more about our level of support, call (888) 667-5151 or visit stewart.ca. Untitled-3 1 2018-07-04 10:44 AM Daniel Therrien says the amount of staffing his office has is 'insufficient' when it comes to dealing with data-breach reports.